We want to take an opportunity to tell you about a great man, who, although strained by physical impairments, has not let his suffering stop him and instead strives to inspire others facing the same kind of challenges. Sergeant Rick Bell joined the Army years ago and was recruited to go on missions with the Green Berets. During Operations Desert Shield/Desert Storm, he deployed from Fort Campbell, Kentucky, with the 5th Special Forces, enduring explosions and combat action that would forever affect him. Returning home with pain and other symptoms, he was diagnosed with Gulf War Syndrome, a label doctors used for a kind of mystery disorder afflicting military personnel returning from the war in the Middle East. It was only this year that Rick found out that his back had been broken in five places. He was also diagnosed with a traumatic brain injury, post-traumatic stress disorder, and chronic obstructive pulmonary disease, which makes breathing difficult and is a result of oil fires in Kuwait. At the onset of his disability, Rick stayed active and as mobile as possible, remaining in the Army Reserve as a recruiter and unintentionally worsening the injuries. Consequently, he is in a wheelchair full-time today. This experience has led him to establish the Blessed Hope Ranch, a ministry to connect others who are wheelchair-bound with horses, providing another kind of freedom of movement and outdoor activity. He operates the ranch on 44 acres in southeast Ohio, splitting wood, mucking stalls, and clearing paths through the woods, all despite his handicap. It was the sergeant’s story and selfless service that caught our attention, and we at Freedom Alliance believed that somebody ought to do something for Rick. Every year, the Miami Valley Golf Association of Dayton, Ohio, organizes a “Freedom Alliance Classic” golf tournament to benefit the Support Our Troops program, as well as our Scholarship Fund, which provides financial aid to college students whose parent was killed in service or rated 100 percent disabled. This was the eighth annual “classic,” and we thought it was the perfect venue to present Ohio resident Rick Bell with an all-terrain Action TrackChair. The sergeant was there that day at the seventh hole with his wife of 27 years and five of their six children. 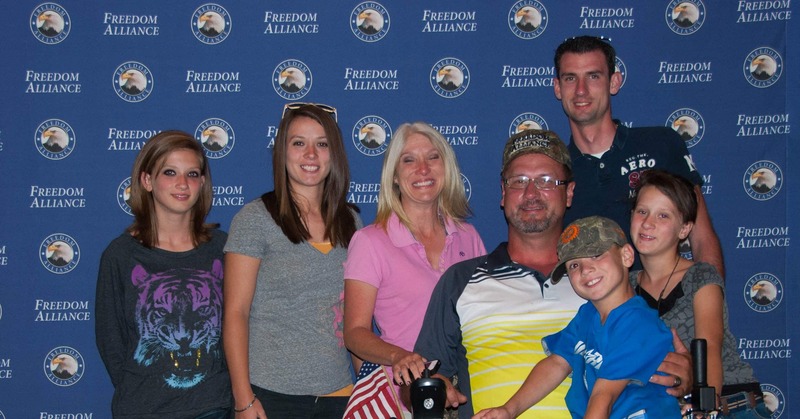 The golfers had the pleasure of meeting Rick and his family during the competition. It was at a dinner and presentation later that Freedom Alliance gifted the TrackChair to this outstanding veteran. Freedom Alliance president Tom Kilgannon brought one of our scholarship recipients, Shannon Zangas, on stage to tell her story. He explained that Shannon’s dad had given his life in service to others, and that Sergeant Rick was very much like her father, always giving to help other people. With tears and stifling emotion, Rick powerfully expressed his “overwhelming joy” and accepted this “dream come true,” saying how the chair will enable him to bless others the way he has been blessed. While he was trying out his new chair, Rick’s youngest son, Ty, crawled into his dad’s lap. “Now I can go fishing with my dad,” he remarked. Many thanks to the Miami Valley Golf Association for supporting our troops and their families, and for allowing us to incorporate the TrackChair presentation into their program. And special thanks to Rick Bell for giving your health to defend our freedom and giving what you’ve got left to help others live better.